Budva, the heart of the Adriatic coast of Montenegro, is definitely the metropolis of the Montenegrin tourism. Thanks to the great number of beaches, hotels, natural beauty and rich historic monuments, Budva is the most desirable tourist destination in Montenegro! Old Town (Stari Grad): The star attraction and the best place in Budva is the Old Town. It is a truly lovely place that reminds like mini-Dubrovnik. The Old Town is very small and holds the main historical monuments and signs. The protective walls in the Old Town were built by the Venetians when they ruled the area. Thus, much of the architecture is of Venetian Design. The Old Town is opened 24 hours a-day and you can visit many interesting shops, restaurants, cafes and galleries. Definitely, the Old Town is a place for long walks and promenades. Saint Stephen (Sveti Stefan): Undoubtedly, Saint Stephen is a big attraction on the Riviera of Budva. Previously it was a fishing village, but now it became a small hotel-town, where many celebrities enjoy their time. Although the island is closed for non-resort guests, the north and south beaches of the island are open for the public. Island St. Nicola: This is the largest island in the Adriatic area with a length of 2km. Locally known as “Hawaii” with breathtaking surrounding, the island has three bigger sandy beaches and numerous smaller that can be reached only by boat. Jaz Beach: It is one of the largest beaches in Budva. Jaz is a sandy beach with turquoise water and beautiful open sea view. Mogren Beach: Mogren beach is 150 m away from the Old Town and is made of two beaches joined by a tunnel. Legend says that Mogren beach was named after sailor Mogrini who built a church on the beach. Kamenovo: Situated between Becici and Przno, Kamenovo is clean and sandy beach, more family oriented. Queens Beach (Kraljicina Plaza): Definitely, this is one of the most beautiful beaches on the Mediterranean. It was named after it was favorite place of Queen Marija Karadjordjevic. Nightlife in Budva: Budva is famous for the younger generations for the spectacular nightlife. The place has variety of cafes, restaurants and nightclubs. There are many outdoor bars and cafes located outside the walls of the Old Town. Most of the international parties are in July and August when the place is visited by international DJ’s. Also, beach parties are popular during this period of the season. Top Hill is one of the most famous nightclubs in Budva that accommodates up to 5000 people at a time. Porto Restaurant: Very delicious food, with great ambience. Kangaroo Restaurant: Here, you can find great meals with decent prices. The restaurant serves both traditional meals and seafood. Jadran: Jadran is a premium restaurant in Budva that has 3 terraces. The restaurant serves the best seafood prepared in a local way. Climate: Budva has a typical Mediterranean climate with long, dry summers and mild rainy winters. The average temperature in July is around 28 °C, while 8 °C in January. Generally, the tourists from all over the world go to Budva by airplane, bus or car. The air transport takes place via two international airports: Podgorica Airport (65 km away) and Tivat Airport (20km away). Busses between Budva and Podgorica run very often and the cost is only 6 euro. Also, Budva is very well connected by bus with other major cities in Montenegro, as well as with cities in neighboring countries. If you go in Budva with your car, try to use it inside the city only if you have to. During the summer season, the traffic is very crowded and parking spaces are hard to find and expensive, especially in the Old Town. There are varieties of choices for accommodation in Budva. Depending on your preference, you can easily find apartments, cheaper hotels, as well as great five-star hotels. You can choose to stay on the high ground of the peninsula, which is quieter, or in the busy Old Town. Budva is a small city; you can easily reach every part of the city with a public transportation. 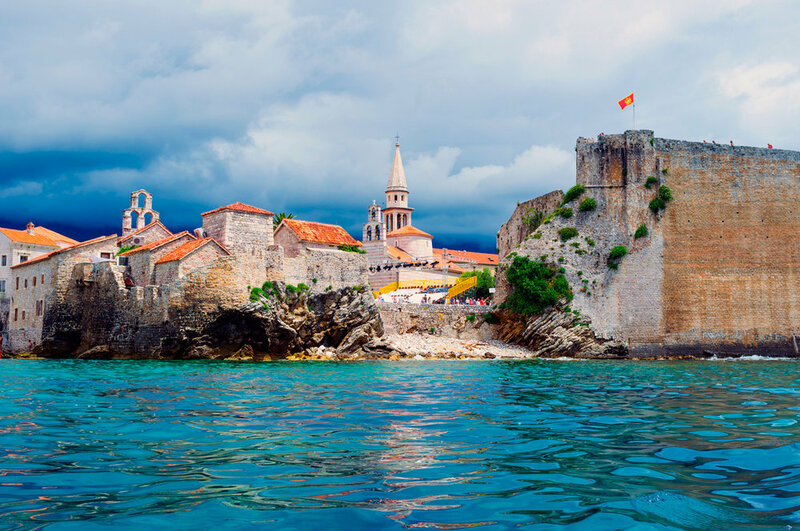 Budva is one of the oldest cities on the Adriatic coast. It was first inhabited 2500 years ago. The Budva Riviera is 25 km long, covered with sandy beaches, capes, coves and picturesque settlements. During the summer period, the most visited destination in Montenegro turns into a City Theater, and offers its visitors opportunities to enjoy music events, theatre plays and many entertaining programs happening both during day and night. Budva is definitely a must visit place in Montenegro. The best holiday hotspot is dedicated to provide tourists with great offers to enjoy their stay. I am a digital marketer and content writer. Travelling is my passion. I like visiting exciting places, meeting new people and being in touch with cultures in different parts of the world. I’ve mostly travelled around European countries, especially during the summer period. Also, I’ve participated in the Work&Travel program, and I’ve spent two awesome summers travelling and experiencing the best adventures in the USA. Travelling keeps me living and experiencing this wonderful world. Every turn around makes a new memory, and every new place has a special taste. Never stop travelling!